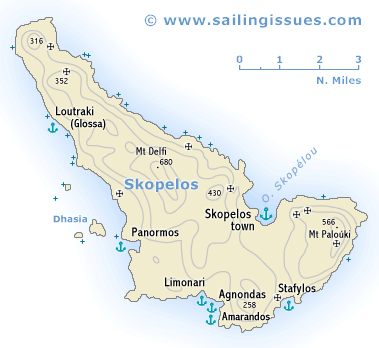 Skopelos - Σκόπελος, known in antiquity and until the 3rd c. as Peparethos, is a hilly and well-wooded island. The steep north-east coast is unwelcoming, and, apart from the wide Bay of Skopelos (Ormos Skopelou) near the east end, without anchorages or inlets of any consequence. The gentler south-west coast is also relatively featureless, yet holds a range of breath taking anchorages like Stafylos, Agnondas and Panormos. Skopelos thrives on its agriculture and the island is devoted to the growing of olives, plums, almonds & walnut trees. Where the slopes are too steep for cultivation, pine trees grow, giving an overall impression of green fertility not found on many Greek islands. There are many springs and streams, and much like it's neighbouring island of Skiathos, it reflects the lushness of the Pelion Peninsula nearby. There are many convents in which the nuns make woven goods and other craft products. The tourist trade also makes a big contribution to the economy. The oldest traces of human settlement date from the Neolithic period. The ancient city of Peparethos was said to have been founded by the Cretan hero Stafylos, son of Dionysos and Ariadne. In the so-called Tomb of Stafylos gold jewellery, idols, a variety of implements and utensils and Minoan double axes were found; they are now in the Volos Museum. The archaeological evidence indicates, however, that from an early stage the inhabitants of Skopelos were influenced by Mycenaean rather than Minoan culture. After the 7th c. BCE Skopelos prospered, and the tribute it paid as a member of the first Attic maritime league was substantial. The Peloponnesian War, however, quickly and finally put an end to its prosperity. Thereafter it had a series of different masters - Macedonians, Romans, Byzantines, Venetians and finally Turks - who allowed this remote and economically unimportant island a considerable measure of autonomy. In 1830 it became part of the new Greek kingdom.